When talking about the history of literacy, it is necessary to examine the history of writing technology. Writing is often referred as one of the major communication revolutions in human history (Gunaratne, 2001). There have been several significant developments in writing over the course of time. First, people only used pictographs to express ideas. Then, word-based writing systems developed. After that, people developed sound-based syllabic writing systems. Lastly come the invention of a written alphabet. Ong (2002) points out that writing itself is a technology that calls for the use of tools and other equipment like writing instruments and surfaces. People recorded writings on various surfaces such as stones, metals, wood, wax and clay tablets, papyrus, and parchment using different types of writing instruments such as styli, brushes and pens. The invention and development of pens and paper contributed to the expansion of literacy to the masses. As early as 3000BC, the Egyptians used reed brushes or pens to produce hieroglyphic and hieratic writings on papyrus scrolls. They used papyrus until the first few centuries AD. Papyrus was an effective writing surface because it was thin, light and flexible (Fischer, 2004). It was also easily stored. Reed pens made out of reed straw or bamboo allowed scribes to make marks on papyrus in a more precise way than reed brushes, so reed pens became the more common writing tool. The adaptation of this new writing tool eventually led to the emergence of a new writing system. Some historians believe that the Greeks gradually changed the direction of writing from right to left or from top to bottom to the modern western style writing of left to right in order to overcome the limitations of the reed pen (Bhavnani & John, 1998). Reed pens had a problem of easily catching in the fibers of rough papyrus. Reed pens and papyrus were eventually replaced by quill pens and parchment. Bhavnani and John (1998) argue, “humans throughout history have developed devices and processes to assist in the efficient performance of tasks” (Bhavnani & John, 1998, p. 273). Writing became easier with technological development and improvement of the writing instruments. There were also other types of writing surfaces used throughout time. In the first millennium BC, Romans wrote on wooden tablets with the sheets of wax. They used a metal stylus as a writing instrument. Europeans also used parchment and wax tablets during the Dark Ages. 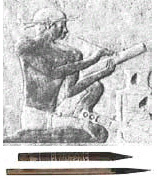 They used a metal or bone stylus as a writing instrument. 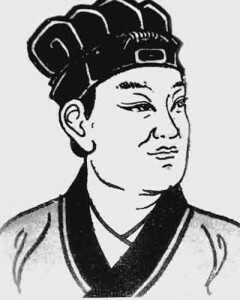 The invention of paper and the papermaking process are generally credited to the Chinese royal court official Cai Lun. Before the invention of paper, Chinese used wood, bamboo, silk, or other harder materials as writing surfaces (Goodrich, 1963). They were looking for cheaper and more practical writing materials. Cai Lun developed paper and the papermaking process in 105AD. There are also some recent discoveries that push back the date of the invention of paper a few centuries back before Cai Lun (Gunaratne, 2001). The paper, instead of bamboo, wood, or silk became the primary writing material. Papermaking process spread to other parts of the world following the Silk Road. According to Gunaratne (2001), the use of paper spread to Samarkand in 650, to Egypt c. 800, to Spain c. 950, to Constantinople c. 1100, to Italy in 1154, to Germany in 1228, and to England in 1309. The manufacture of paper also began in these places; in Samarkand in 751, in Baghdad in 793, in Egypt c. 900, in Spain in 1150, in Germany in 1391 and in England in 1494. Papers and printed materials gradually became available to the masses, which helped their literacy. Quill pens became the primary writing instrument in the 7th century and were commonly used until the 19th century. Quill pens were made out of the primary flight features, usually from goose. It required a significant amount of labor to produce just one quill pen, but it was strong and durable once it was made. Quill pens allowed people to produce different styles of writing. For example, the German Gothic style of writing began to appear with the use of quill pens (Cheong, 2009). In addition, the quill pens allowed people to write much smaller letters. Quill pens remained as the principal writing instrument for several centuries. A number of important documents were written by quills: the Bible, the American Declaration of Independence, and William Shakespeare’s plays (Cheong, 2009). Similar to reed pens, quill pens required sharpening or reshaping of the tip. However, their flexible pen tips allowed people to create expressive and decorative styles of handwriting, such as Copperplate and Spencerian (Cheong, 2009). The invention of paper greatly influenced the printing press. Gunaratne quotes Laufer, ”The invention of paper was the turning point in the history of printing” (Gunaratne, 2001, p. 465). The invention of paper also changed the physical act of writing. It required scribes special skills to write on early writing surfaces with early writing instruments. Ong says, “Special mechanical skills were required…and not all ‘writers’ had such skills suitably developed for protracted composition. Paper made writing physically easier” (Ong, 2002, p. 94). Cheap paper and printing technology contributed to the spread of literacy. Printing on parchment and vellum was very expensive. According to Twede, “Only a third of the Gutenberg Bibles were printed on rag paper. The skins of 300 sheep were needed to print one Bible” (Twede, 2005, p. 289). The use of paper drastically lowered the cost of printing. There was an extensive paper industry in England in the 1500s. William Rittenhouse built the first paper mill in the US near Philadelphia in 1690 (Twede, 2005). The next major development in writing instrument is the metal point pen. In 1808, English engineer and industrialist Bryan Donkin patented a steel point pen (O’Sullivan, 2010). However, pens with steel nibs did not come into common use for a few more decades. The mass-production of tough and strong steel pens, which could last, began in the 1830s. The quality of steel pens kept improving and they completely replaced quill pens by the 1850s. The new type of papers also appeared around the same time. In the mid 1800s, the Canadian inventor Charles Fenerty and the German inventor Friedrich Gottlob Keller took a challenge to make papers out of pulps instead of rags. Wood based paper replaced rag papers by the end of the 19th century. Clifford says, “The invention of paper, the printing press, and the substitution of wood pulp for rags in paper manufacture were both cause and effect of an expanding literacy” (Clifford, 1984, p. 472). Various technological developments made papers and printed materials cheap for people. These technological developments helped spread literacy to the masses. The mass-produced steel pens had a significant impact on literacy as well. Cheong says, “For the first time, cheap, reliable pens were available in their thousands to the masses, which greatly boosted literacy rates and helped to improve education” (Chelong, 2009). Steel tips were much more reliable than previous writing instruments, which made writing much easier. Next comes the significant shift in technology. All previous pens from reed pens to steel pens were all dip pens. Dip pens were not portable. 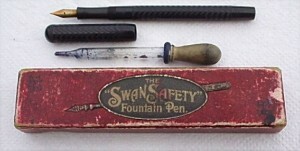 In 1884, Lewis Edson Waterman received a patent for his fountain pens. His fountain pens were more reliable than previous fountain pens with a leaking issue. Around the same time, the principle of the ballpoint pen was developed, but they were not exploited commercially until much later. Josef Lazlo and Georg Biro invented the modern version of ballpoint pen in 1943. In October 1945, the ballpoint began its first sale in the US market. Today, pens and paper still remain as major writing instruments. According to the data by Writing Instrument Manufacturers Association, the US market for pens was approximately $3.25 billion in 2007 (WIMA, 2009). The U.S. also produces and consumes about 100 million tons of papers per year (Goyal, 2010). The invention and development of pens and paper have been influencing the literacy of people for many centuries. Whether they will remain to be the primary writing instruments or not in the future is unknown. More and more information is created and stored digitally today. Pens and paper will not become obsolete yet, however, the emergence of computers is challenging the roles of pens and paper in literacy. With the development of new technologies in the Information Age, we will constantly need to reexamine the definition of literacy. Bhavnani, S. K. & John, B. E. (1998). Delegation and Circumvention: Two Faces of Efficiency. CHI 98, 273-280. Clifford, G. J. (1984). Buch and Lesen: Historical Perspectives on Literacy and Schooling. Review of Educational Research, 54 (4), 472-500. Fischer, S. R. (2004). A History of Writing. London: Reaktion Books. Gunaratne, S. A. (2001). Paper, Printing And The Printing Press. International Communication Gazette, 63 (6), 459-479. Ong, W. J. (1982). Orality and Literacy: Technologizing of the Word. New York: Routledge. Twede, D. (2005). The Origins of Paper Based Packaging. The Future of Marketing’s Past, Proceedings of the 12th Conference on Historical Analysis and Research in Marketing, pp 288 300. California: CHARM Association (Long Beach, April 28 March 1). This entry was posted in Research Paper and tagged paper, pen. Bookmark the permalink. great job…. just wondering, did u load your pics in a different space? Hi, Soraya. This is what I did to upload pictures. It’s interesting to read about the development of one of our most essential tools. It seems they always develop in a way that’s easier and generally cheaper. I wonder if our computer technology is evolving like that? I think I will always want a pen or pencil at hand! I am with you that I will always want a pen or pencil! I am very curious to witness how writing instruments will evolve in the future. I am sure that pens and pencils will stay for a long time. But we are also going back to using a tablet and stylus…just a different kind of tablet and stylus – iPad and iPad stylus.